The story behind the story that U.S. journalist Adam Piore recently published in the online magazine The Atavist began in April 1999 shortly after he had landed in Cambodia for the first time. Had they been less inept, millions of gallons of highly flammable fuel may have ignited to disastrous effect on the waterfront just a short drive beyond the Japanese Friendship Bridge. 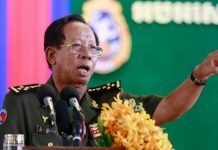 As is often the case in Cambodia when it comes to so-called plots against the government, the police had been warned in advance by an anonymous tip and arrived while the men were still struggling with the Armbrust rocket launcher—a shoulder-fired weapon that shouldn’t have been too difficult to master. Later, at the police station, the five men would claim membership to an unknown revolutionary group: the Cambodian Freedom Fighters (CFF). Since nothing had happened except for the would-be terrorists’ arrest, Mr. Piore was told to summarize the incident in 120 words for The Cambodia Daily. But he felt there had to be much more to that story than incompetant revolutionaries. He ended up following the CFF story and its strange developments for more than a decade, which he recounted in the online publication The Atavist in April. Entitled “The Accidental Terrorist,” Mr. Piore’s account follows the rise and fall of Chhun Yasith, the Cambodian-American tax accountant who launched the CFF group out of his small office in Long Beach, California—the capital of the Cambodian community in the U.S.
“The Accidental Terrorist” describes the bizarre episodes that included Chhun Yasith setting up a base of operation in Thailand where he met with members of Cambodia’s various political groups, and then orchestrating in November 2000 a bungled armed attack on government offices in Phnom Penh that claimed the lives of at least seven people. 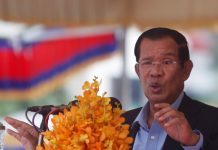 The violent, if poorly organized and executed, attacks were branded a coup by the government, and grandiosely by Chhun Yasith as his attempt to topple Prime Minister Hun Sen’s government. Though the fighting took place over several hours one November night in 2000, there was never any chance that CFF rebels threatened the government’s grip on power. Mr. Piore’s story lists intriguing details such as the fact that Chhun Yasith was asked to raise funds for the U.S. Republican Party after his name had been linked to the failed “coup” and that he dined in Washington, D.C., with President George W. Bush and 7,500 other party supporters in the mid-2000s. Investigated by the FBI, he was later brought to trial and, in April 2008, found guilty of conspiracy and of engaging in a military expedition against a nation with which the U.S. is not at war. Chhun Yasith is now serving a life sentence in a U.S. high-security federal facility, where he is filing an appeal against his sentence. Mr. Piore’s story is written in a genre referred to as narrative journalism to which digital technology has given rise. “The Accidental Terrorist” is around 12,000 words while magazine stories may range from 1,000 to 4,000 words and books require upwards of 35,000 words. With this length and story format, one could not avoid some shortcuts through Cambodia’s complex history of the last decades. However, since The Atavist is also a platform that makes stories accessible on an iPad, iPhone or in text-only versions for Kindle, Nook, Kobo and Google Play, Mr. Piore created in the text links to additional anecdotes and information that would have broken the flow of the story itself but could be of interest to some readers, he explained. In the course of his research, Mr. Piore interviewed the FBI agents who had investigated Chhun Yasith, went to Long Beach to meet with his family and friends, and read pages after pages of court documents from the trial. Since Chhun Yasith is in a maximum-security penitentiary, Mr. Piore was not allowed to meet him for the story but they corresponded at length by email. Although Mr. Piore also wanted to retrace the story of the CFF, his main goal was to find out who Chhun Yasith really was. “What would prompt someone who is an accountant, who has money, has established a peaceful life in the United States, and has a family: What would prompt him to undertake such an unlikely effort and risk it all,” he said. Here was a man who had fled the Khmer Rouge, immigrated in 1982 to the U.S. where he had acquired four unofficial wives in succession as well as 10 children, and had managed to enroll hundreds of Cambodian Americans into contributing time and money for an armed movement to topple the Hun Sen government in Cambodia. When Chhun Yasith was finally arrested, Cambodians in Long Beach—whom he had helped with everything from social assistance and immigration paperwork to advice about their teenagers lured into gangs—volunteered the money to help him post bail. “They offered to put up $1 million…. These were poor Cambodians who were willing to put up their houses as collateral and everything they owned to try and get this man out of prison,” Mr. Piore said. Still, people died, others were injured and at least one man was maimed in the 2000 attack. 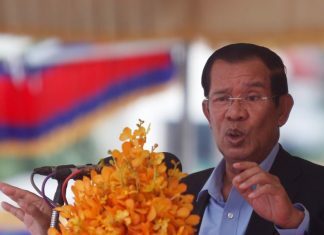 Some CFF members arrested after the bungled “coup” are still serving life sentences in Cambodian jails. An intriguing detail that Mr. Piore points out is the fact that Chhun Yasith was convinced that the U.S. would approve of his efforts to topple Mr. Hun Sen. After all, U.S. Representative Dana Rohrabacher had penned a resolution calling for the prosecution of Mr. Hun Sen for “war crimes, crimes against humanity, and genocide” during the Pol Pot regime and, even though no evidence had ever emerged linking the prime minister to Khmer Rouge atrocities, the lawmaker’s resolution was passed by the U.S. House of Representatives in October 1998. Mr. Piore spent four months writing the story. “Even though there are some elements of Chhun Yasith’s story that are sad, it was wonderful to remember the places in Phnom Penh, to imagine the Russian Market for instance…I miss Cambodia,” he said. The Atavist publishers sent Mr. Piore’s story to a prominent agency in Hollywood so that it can be sent to a movie producer. But based on his past experience with the film industry, Mr. Piore says he does not expect to see the odd story of the CFF and Chhun Yasith brought to the screen in the near future. Having worked for Newsweek magazine after his time at The Cambodia Daily, Mr. Piore is currently a contributing editor to the science publication Discover Magazine and also writes for a number of other magazines including Conde Nast Traveler, Popular Mechanics, Scientific American and several business publications.